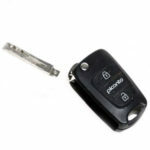 Is your key remote showing signs of wear? or even worse is broken. Recently we have seen a increase in blades falling out of remote’s because the remote metal casting that holds the blade breaks, This then makes it very difficult to use the remote.